A farmers' market in mid Wales has been crowned the UK's best, beating rivals from London and Belfast. 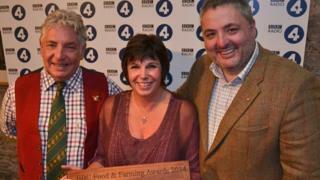 Aberystwyth came top in the best food market category in the BBC Radio 4 Food and Farming Awards. With up to 30 stalls, it was up against tough competition from St George's Market in Belfast, which has 230 stalls, and London's Brockley Market. Meanwhile, Pembrokeshire Beach Food Company won the best street food/takeaway category at the awards. The company combines foraged seashore ingredients with fresh local seafood - all served from its mobile beach shacks. Aberystwyth Farmers' Market was established in 2000 and was previously voted among the top 10 in the UK by The Times newspaper. Of the latest award, councillor Gareth Lloyd, Ceredigion council's cabinet member for economic and community development, said: "Just to be shortlisted was an excellent achievement in itself, but to go one better and win the award is very special. "I'm glad that the fine work that's been done has been recognised by Radio 4 and I'm sure it will play a part in promoting the market and helping it to grow even further." BBC Radio 4 Food and Farming Awards judge Peter Gott, who is a farmer and market trader, praised the spirit shown by Aberystwyth's market traders during major storms in the town in January. "What got me about the community was that in the really wet times of January and February the traders had rung up the council and said please don't cancel the market - we desperately need to serve our customers," he said. Fellow judge, chef Richard Corrigan, described the farmers' market as "the most individual group of artisans I've come across personally". Pembrokeshire Beach Food Company has one of its shacks on Freshwater West Beach, near Pembroke, and has a couple more touring the country during the summer music festival season. "It's a shock. We won the British street food awards in 2011 and never expected to win another award," said owner Jonathan Williams. "This award recognises our hard working team. We champion local shellfish and local food suppliers and that helped us get this award. We're delighted." Each year, the BBC Food and Farming Awards celebrate the people and organisations behind the best of British food. A team of judges, including some of the UK's best-known chefs and food writers, select finalists across 10 categories. Does farmers' market food taste better?